Every once in a while, I get a wild hair and decide to get my hair chopped off. It’s only after I do this that I realize, every time, that it’s cold outside, like January cold. Whatever wild hair that caused my poor planning disappears, and I realize, it’s just hair. It. Will. Grow. Out. The last time I did this was in the fall of 2013. I got a chin-length bob that was a bit shorter in the back, as in shaved shorter. I quickly grew tired of my neck being cold, especially in the meat locker that was my office at the time, and I began to have a strong dislike of scarves around my neck that continues to this day. Around Christmas 2013, I started the process of growing my hair out. Again. This time around has taken less time, and my hair is the healthiest it’s ever been. I started taking one biotin supplement each day, along with my other vitamins. I get the 7500 MCG Super Strength Biotin from Sundown Naturals. Kroger usually has a sale, buy one, get one free, and I usually have a coupon. So, not much change. The Hair God has mentioned on several trim and touch-up visits that my hair seemed to be growing faster than usual, while being healthier than usual. One of my co-workers, who could never get her hair to grow, started taking biotin after seeing my results. She is super happy to have long hair for the first time in her life. 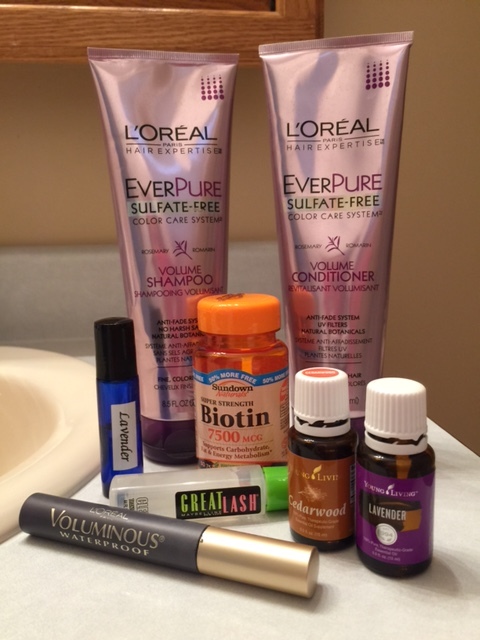 In March, I started using essential oils on my hair. I added one drop each of lavender and cedarwood to an 8 oz. bottle of shampoo and an 8 oz. bottle of conditioner. Both essential oils help with hair growth, strengthening and thickening. On my last visit to the Hair God, my friend, Lori, commented on how healthy and soft my hair was. Since then, I discovered I should have been adding one drop per ounce of shampoo and conditioner, instead of one drop per bottle. Even better results. Like biotin on steroids. Some of my “oily” friends add a drop of rosemary per ounce, along with the lavender and cedarwood. I haven’t tried it yet, but likely will in the near future. Others make sprays and such. I love the simplicity of putting the essential oils into bottles of shampoo and conditioner I already use and shaking the bottles up to mix the added ingredients. The Hair God usually tells me when the long hair is no longer working for me. This is usually when it begins to resemble Ally McBeal’s hair. But this may be the longest my hair has ever been, halfway down my back. I’m wondering what he’ll say when I see him Tuesday. I’ll post a comment to let you know. As an added bonus, let me share a trick to lengthen and thicken your eyelashes: one drop each of lavender and cedarwood in your mascara. Use the mascara wand to mix it around in the tube. On days when I’m blissfully makeup free (i.e. not leaving the house, haha), I put on clear mascara to which I previously added the essential oils. What?! Another bonus tip?! I have a mixture of 10 drops lavender and the rest pure grape seed oil in a 10 ml roller bottle that I’m using on my eyebrows. I just roll the mixture over my brows before I go to bed at night. I’ve been doing it for about a month and have noticed my eyebrows aren’t as wimpy. So, hair you go. Sorry, I couldn’t resist. A. I love your pun at the end (I’m cheesy like that too, lol!) but B. I never thought about doing a roller for eye brows!!!! I know how well the Cedarwood and Lavender combo work for hair… But NEVER struck me for my brows (they are PUNY!) Thanks, and I love your blog!!!! Brandy, you are such a sweetie! I have to admit to being lazy. I started out with lavender and a carrier for a scar and brows, and then added frankincense. I’ve been using that on my brows lately. I will get off my duff and make a separate roller of lavender and cedarwood.